The spectacular success of electronic commerce in recent years has seen an explosion in the availability of information and entertainment products on the Internet. This distribution of `content' is expected to continue as one of the major sources of growth on the Internet in the years ahead, raising concerns over the protection of content owners' rights. Concerns over the effectiveness of the copyright system in a digital environment have inspired content providers to look for alternative protection regimes or strategies. These alternatives, such as the protection afforded by contract law and information technology, comprise important elements of the Electronic Copyright Management System (ECMS), a fully automated system of secure distribution, rights management, monitoring and payment of copyright-protected content currently being developed. Perhaps the largest multidisciplinary study conducted on ECMS to date is the IMPRIMATUR project, which was subsidised by the European Commission's Esprit Programme, and for which the Institute for Information Law of the University of Amsterdam (IViR) produced a series of legal studies. 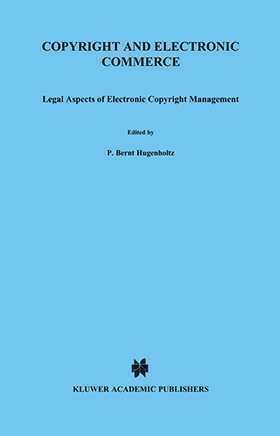 This volume collects six fully revised and updated studies relating to copyright and electronic commerce which have resulted from the IViR's research. As well as examining the legal issues crucial to the development of electronic copyright management systems, the contributions address issues with wider implications for the law of copyright in general.